I use RDP to access my work PC on a daily basis and one of the limiting factors when doing web design has been the lack of colour depth - rather than the standard 24-bit (or higher) you get 15-bit due to using Remote Desktop (RDP). Although this is the default RDP server setting, you can increase it to 24-bit with a little Windows Registry hack. Over on the right-hand side you will see an attribute called "ColorDepth" which by default is set to 3 (or rather 0x00000003, it's a DWORD). 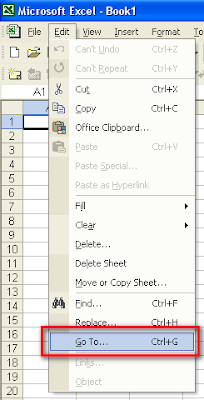 Double-click that attribute and change the Value data field from 3 to 4, then click "OK", close regedit and reboot your PC. Now if you increase the requested colour depth when connecting to this machine you should get a few more colours to play with! Oh BTW Merry Christmas and a Happy New Year! Late on Thursday night I broke one of my electric guitar strings and being a beginner I didn't have a pile of replacements to drop in straight away. I'd placed a couple of small orders with StringsDirect over the past few months and had such fast delivery that they were my first port of call. I placed an order for a couple of packs of handmade DR Strings (one Tite Fit and the other Hi-Beam) around midnight on Thursday night and what with the Christmas post service issues (along with various PO strikes) I had little hope that they would be with me before Christmas. They arrived on Saturday morning, nicely packaged, all the correct bits I ordered - absolutely perfect! So if you need any guitar accessories, take an online trip to StringsDirect, they have loads of items and the delivery service is second to none! As an aside, I picked DR Strings after Justin Sandercoe of www.justinguitar.com recommended them - his online guitar tuition site is second to none and I trust his judgement on products and accessories. I was doing my daily Bloglines reading today when I can across this post from Dave Thomas which made me think "wow that really is quite pretty" (I am a techie after all, and who doesn't get excited when they see Ruby in a nice big font size?). It was generated by a funky web application called 'wordle' which makes beautiful word clouds from words of your choosing. Point it at a blog, RSS feed, del.icio.us username or straight ol'piece of text and it creates the most wonderful word image map. They are so nice I'm thinking of getting the image printed onto a t-shirt for that true geek factor! 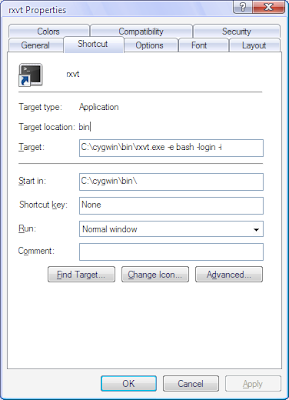 If you use Windows for software development you will have probably come across Cygwin at some point, the Unix shell for Windows (well a bit of a fake console but it will have to do!). The console out of the box is a bash shell running within a normal Windows cmd prompt box, which is ok but doesn't really give you all the features of a proper Unix shell, click and drag to select text, middle click to paste, decent scroll buffers, etc. However there is a solution to these issues - scrap the silly Windows DOS box and run RXVT instead! First off you will have to run the Cygwin installer again (don't worry it's quite clever and won't corrupt your current version of Cygwin) and select the rxvt terminal package to install. Then continue the installation as normal so that you are left with the Bash shell shortcut icon. The above sets the background to be black like a normal shell, creates a pretty big console buffer and puts the scrollbar on the left (personal choice). It also sets the font to a rather large but cool Apple Monaco font, if you want a more normal font delete the Monaco font line and remove the comment '#' from the front of the other Rxvt.font line. 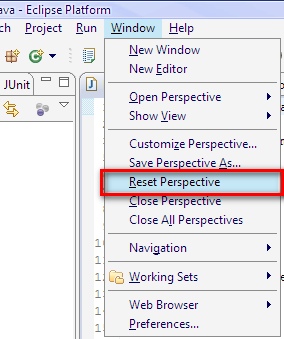 Choose the 'Reset Perspective' option from the 'Window' menu to restore all the default options which includes the right-click context menus! I had a spreadsheet recently (actually a CSV file which contained numerous columns of data. The values in the cells were either blank (empty) or the letter 'Y'. I needed to change all the blanks to 'N'. Find and replace didn't work as you can't specify blank as a matching character (at least I couldn't find out how, please comment if you know!) and I didn't have the energy or time to manually update each cell. 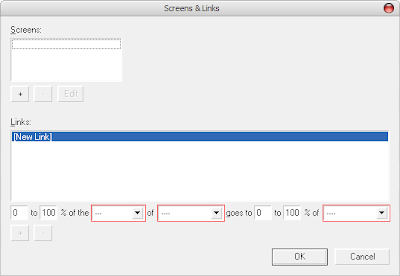 After some research I found that the answer was the 'Goto -> Special' options hidden within the 'Edit' menu. 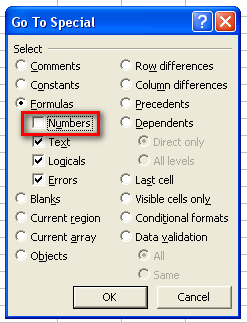 Select the columns and/or cells that you want to perform the special find within (hold down CTRL as you click the column headers or individual cells. 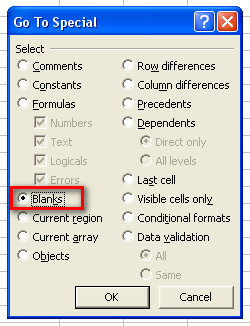 Any cells within your selection that contain blanks will now be selected leaving the other non-blank fields un-selected. If you now type and press ENTER it fills that first cell with what you typed and moves to the next blank cell. BUT here is the trick, if you type what you want in the cell and press CTRL+ENTER then all the blank fields will be filled with the entered values - pretty neat huh! 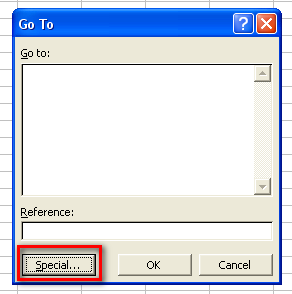 Remember, the 'Go to -> Special' helps you select the correct cells, the CTRL-ENTER auto fills them all with the value you enter in the first selected cell. I found this information out from the rather useful Excel section of allexperts.com. 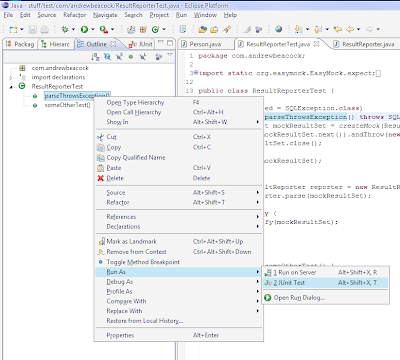 Eclipse supports JUnit out of the box, and even has a handy keyboard shortcut for running all the test methods within a JUnit test class: CTRL-F11. 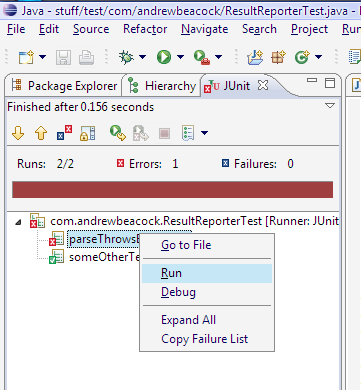 You can also right-click within the unit test class, choose 'Run As' then 'JUnit Test'. But what if you want to run just one of the many test methods with a particular test class? IntelliJ's IDEA has this option (you just right-click on the method name and run it) but Eclipse doesn't offer that feature. That means that you don't have to run all the tests within a test class just to be able to run one of them. Now isn't that easier? Oracle uses the ampersand (&) symbol within a string to indicate a substitution variable. But what if you want to use an ampersand as part of a regular string such as 'Bob & Sons'? Add that to the top of your Oracle SQL script or type it manually at the SQL*Plus prompt. These tips plus many more can be found within the rather useful The Oracle (tm) Users' Co-Operative FAQ. I found an interesting Hibernate view-related issue yesterday when deleting some data from a table within a single transaction. Let me set the scene a little - we have a People table which has one row per person. We have a FamilyTree database view which displays family trees using the People table as one of it's sources (it's quite a complex view with functions and the like but you get the picture). I was writing some unit tests around the area of deleting people. I used the view to get a list of people, deleted a person from the People table and then used the view to ensure that the person was gone. All of this was done with Hibernate-annotated domain objects and some JPA-based DaoSupport style classes - the standard Spring/Hibernate way. What I found was that when we were within a single transaction (i.e. within a unit test or within a web controller using the OpenSessionInView) and we delete from the table, the 'deleted row' is still visible and therefore incorrect. If you looked at the SQL trace you would find that the DELETE SQL statement was never flushed to the database as Hibernate is trying to be lazy and only perform such actions when it really has too. As the HQL doesn't make a reference to the People table or the person relationship within the FamilyTree entity, Hibernate does not know that it needs to flush any outstanding People changes before it performs the SELECT. To prove this if we add a simple SELECT * FROM people between the row delete and the view access then the delete is flushed and so the view displays the correct information. As we have explicitly mentioned in the HQL that we want the person child object of the entity Hibernate is forced to flush any outstanding People changes before it performs the SELECT! I know that using database views within Hibernate is considered 'advanced' but it would would be nice to have some kind of @ReliesOn annotation to cover these edge cases. We now have to try and remember this strange behaviour whenever we deal with views. I'm no expert on Spring and Hibernate so I may have got the wrong end of the stick completely - if that is the case then please comment on the right way to solve this problem as I would love to learn! I've found a flash game that I just have to share! It's called Fantastic Contraption and it's brilliant fun for anyone with an engineering mind, it's just so addictive. Give it a go but don't try it at work, you will not be able to do anything else for the rest of the day! I found this via the Arantius blog, thanks Anthony Lieuallen! As you can see this is another test from my previous EasyMock post on how to use EasyMock's expect method when unit testing. We are now testing that when we call the next method it throws an SQLException (to simulate the database going down). As you can see it never calls the close method of the passed in ResultSet - so the test should have failed. It passes because the test has exited before it gets to verify the mock ResultSet for expected behaviour. If you make this change to the above test then it fails as expected, now I just need to fixed the code... So you now know how to test for thrown exceptions and ensure that your mock objects are verified as well! I recently upgraded my television from a Philips 28" widescreen tube to a 1080p Panasonic 42" plasma. My old Sony PlayStation 2 was now looking a little weak when upscaled to 42" so I decided to invest in some component cables to take advantage of the best output that the PS2 had to offer as well as enabling "Progressive Scan Mode" in some supporting games (Guitar Hero 2 for example). Here are my step by step instructions on how to HD-enable your PlayStation2. My PS2 came with some SVIDEO-style connectors and a SCART block to plug them in to. The image quality on my old TV was fine but needless to say on a 42" HD plasma things looked a little different! It's the IXOS XPP104 which is strangely not listed under their PS2 section but under their PS3 section instead (although it does state on the page that it's the "XPP104 PS2 & PS3 Component Video + Analogue Audio" cable). I bought mine from Sound & Vision for £30. Then plug the other end into the back of your PS2. That's the tricky bit done so now pop in your favourite game to see what it looks like. Even without enabling the in-game progressive scan option I immediately noticed a much clearly steadier picture with no combing (scroll down to the tomato) which I was experiencing before the cable upgrade. I also read that if your game does not have an in-game option you can hold Triangle and "X" at the same time while booting up the game but this didn't work for me. Last week I posted about how to implement a Hibernate-safe equals() method using instanceof and accessors (getters) in Eclipse. This showed that you don't want to be comparing the member variables directly but should use the accessor methods to protect against Hibernate's use of proxy objects. My old colleague Guy Francis pointed out that rather than using Eclipse's generated (lengthy and rather ugly) equals and hashCode methods I should take a look at the Apache Commons EqualsBuilder and HashCodeBuilder. They are not only smaller and simpler, they are also much less error-prone and it's very clear which object properties are used to see if an object is 'equal'. I'm going to be using these builders from now on for all my equals and hashCode methods! When coding in Java you often want to check to see if two objects are 'equal'. This might range from a check to see if just one attribute is the same (the ID for example), or a complete comparisons of all attributes all the way up to ensuring that two objects are referencing the same instance of a particular class. There is a lot of information out on the internet about how to write a correct equals() method (and the corresponding hashCode()) but I think Joshua Bloch's explanation from his excellent Effective Java book is the best. Do ensure that instanceof is used when ever checking if two objects have a similar background, the Hibernate proxies seem to respect this check so the proxies are instances of the classes that they proxy. Do ensure that you use the accessors (getters) when getting the member variable values rather than the variables directly as the values maybe lazy loaded so id may actually return null whereas getId() will return the actual value from the database. Feel free to use Eclipse's generator (with the instanceof option selected) as a starting point (I do) but don't forget to add in the extra bits described above. A blog post from wenhu on the subject as well as some information from my colleagues were the sources for this post and the remedy to today's headache! If you use Hibernate then you will have probably wanted at some point to see the underlying SQL that was being run. One solution is to enable SQL logging by increasing the Log4J logging levels of the org.hibernate packages. At DEBUG level you see the SQL but all bind variables are displayed as a ? At TRACE level you get everything and the kitchen sink, SQL, bind variables, results, etc. - it's very verbose! I've not tried it yet, but the next time I need to see the bind variable values I certainly will be! If you are familiar with unit testing and test driven development then you are most probably aware of Mock Objects. A Mock Object is a test-oriented replacement for a collaborator. It is configured to simulate the object that it replaces in a simple way. In contrast to a stub, a Mock Object also verifies whether it is used as expected. Mock Objects were introduced at XP 2000 by Tim Mackinnon, Steve Freeman and Philip Craig with the Endo-Testing: Unit Testing with Mock Objects paper. So how do you use them? Basically you want to test some code that depends on a number of other objects. Some of these objects might have unwanted side effects like talking to a database, or accessing an external URL. Rather than passing in the real implementation (with the above side effects) you would pass in a mock or stub instead. The mock can be pre-wired to expect a number of calls to it's methods from the code under test and will record these calls for verification later. Typically these mock objects were written by hand and so have fairly simple implementations, EasyMock removes that hard work by using Java's proxy mechanism to do most of the heavy lifting for you. 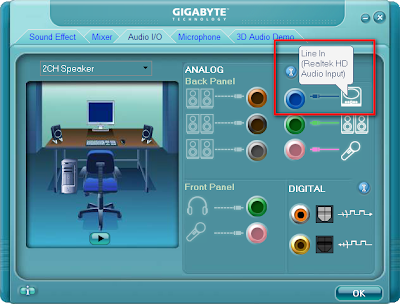 The highlighted part indicates that the Realtek HD Audio Manager knows that you have plugged a 'Line In' device in. You should now be able to record what is being played but you most probably won't be able to hear it! 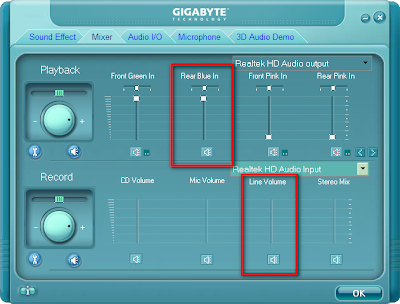 A lot of audio cards give you the option of passing the line in through to the line out so that you can hear it on your speakers but this isn't the case with the Realtek audio. It took quite a bit of messing about to find this out, but it makes sense when you look back at the first screenshot and see that the line in socket is the blue socket. Why they can't label the 'Read Blue In' as 'Line In' I don't know! I've been using IntelliJ's IDEA IDE for the past few years for any Java development work. I've recently moved to a new company who are standardising around Eclipse so I'm slowly getting used to it's way of working and it's many different keyboard shortcuts. Inline code searching is a big plus in my book and my good friend Bill Comer has figured out how to do it - read his post on In line searching in Eclipse & IE7. And as an added bonus this works on Cygwin (the Windows Unix shell) as well as Linux! Ever had your DVD or CD drive completely disappear in Windows XP? I recently installed DaemonTools so that I could fire up an Ubuntu ISO without burning it to disk first but it didn't seem to work properly so I uninstalled it. That is when the problems started, my DVD drive completely disappeared from XP - it wasn't in Windows Explorer and didn't show up via Device Manager either! I tried the "Add Hardware" wizard via the Control Panel but that didn't recognised my drive either so I was starting to get rather worried. After a search on the net I came across a thread on Annoyances.org regarding "all my CD rom drives suddenly dissappeared". This pointed to a solution script from the rather talented Doug Knox who has a script available to restore CD-Roms and DVDs in Windows. Now just reboot and your DVD/CD drive should have been restored! The goal from the beginning for this blog was to write a post a week, that's the incentive that kicks me each week nagging me to write a post even though sometimes I don't want to. 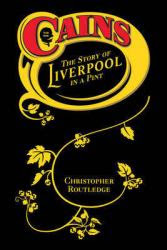 I've seen a number of blogs simply fade into the past after a month or two once the initial novelty has worn off - writing informative well-versed (I hope!) posts is a difficult thing to do in one's free time. I managed the grand total of one post in March but I did have a valid excuse: I had the "new job search" machine on full throttle and was spending every evening pouring over JobServe and various job blog sites. If I wasn't searching for jobs on the internet then I was either preparing for face-to-face interviews or being telephone interviewed and I just didn't have the bandwidth to blog as well. I'm pleased to say that I accepted a new development position a few weeks ago and so I'm finally leaving the mobile telecoms industry after ten years (wow, I've only just realised that it's been that long!) and I'm moving into the financial services industry. Ever wanted to test your website on every version of Internet Explorer (IE)? If you develop websites then you will be well aware of the browser incompatibilities that cause a whole world of pain when you are trying to get something to look the same in all browsers. A blog post about installing multiple versions of IE on your PC by TredoSoft was the source of my information and it's got a lot more information about how it works and what doesn't. 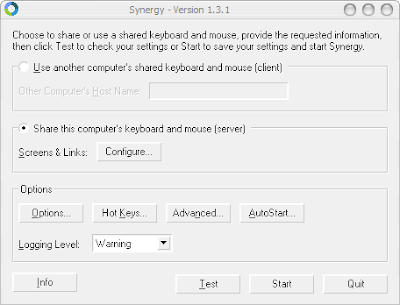 Synergy lets you easily share a single mouse and keyboard between multiple computers with different operating systems without special hardware. It's intended for users with multiple computers on their desk since each system uses its own display. To select which PC you are controlling at any one time synergy lets you simply move your mouse to the edge of the screen in the direction of the other PC, your mouse pointer will then disappear from one screen and magically appear on the other! To enable this you need to set up the "Links". Click "Ok" and then click "Start" to start the server (your desktop PC) listening for connections. 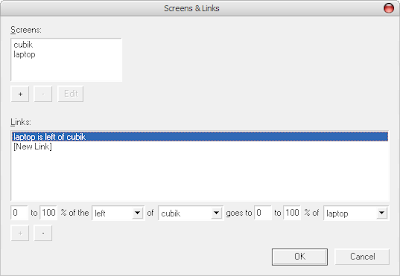 Over on the other PC (your laptop) start Synergy and click "Use another computer's shared keyboard and mouse (client)" and type the name of the other PC in the box, in my case I enter "cubik" as that's the name of my desktop PC. Now click "Start" to attempt to connect to your server. If everything is ok then you should be able to move your mouse over to the left-hand side of your desktop PC's screen and the mouse (and therefore the keyboard) will hop over onto your laptop's screen so that you can control that instead. 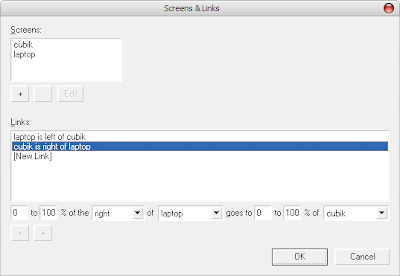 If you want to return control back to your desktop PC then simply move the mouse pointer to the right-hand side of the laptop screen and the mouse will jump back again! If you get stuck for any reason on the wrong PC, just right-click on the Synergy icon in the system tray and choose "Quit". One added bonus is that your copy buffer transfers over to the other PC, try it out - select some text on one screen, then to copy it, mouse over onto the other screen and to paste it. This even works when switching from one screen running Windows to another screen running Linux! My all new Ruby Database Script Runner - now with Objects! Back in December I blogged about how to access ActiveRecord & Migrations outside of Ruby on Rails. It was a little to scriptish for my liking so I've refactored it in a couple of classes instead. Before you had to copy the code to a new file and add your database migration inside the Script.run method. I've now broken this up into a DatabaseScript class that extends ActiveRecord's Migration and has the guts of how and where to run any database commands and then any number of script classes that do the actual work. database_type = databases.keys if database_type.nil? My colleague Mark Lishman has recently started blogging about all things Oracle over on Lishblog. He really knows his stuff and has a habit of explaining it so that mere database mortals such as myself can understand it. He's only just started but already has an excellent post on how to use external tables in Oracle. This is really handy when you have a massive CSV file and want to query it but can't be bothered to write in input script in Ruby or something because you will be scrapping it soon. He's a great Oracle DBA and his blog will no doubt be well worth subscribing to! I use Gaim/Pidgin as my IM client as it can connect to all other IM services (AIM, MSN, Yahoo, GTalk, etc.) but keeps them all within one tidy app. My favourite feature is that when you want to close a conversation window you simply just hit 'Esc' and it's gone. A collegue asked recently why his Escape shortcut was not working any more after an upgrade to Ubuntu Gutsy. In my collegue's ~/.purple/accels file he just had to change <Control>w to be Escape and then it all started working again! Note: This is a non-technical post that I'm making to see if anyone else is searching for information regarding any outstanding bathroom orders - if so, please leave a comment so we can pool our collective wisdom! We placed an order through Bathrooms Italia for a new bath back in January and after repeated phone calls inquiring about the whereabouts of the bath we have found this morning that the site appears to not be avilable anymore and they are not answering their phone - 01845 577 432. After a little digging about it appears that Period Bathrooms are also not answering their phone - 01274 660 770. Both of these companies seem to be public consumer websites for Althea UK Ltd., their number is the same as Bathrooms Italia - 01845 577 432 which is never answered. Due to this I've already contacted my credit card company to report they I've paid for an item that I expect to never receive! Update: I've just had a call from Clearwater (a supplier to Althea) that they have been advised that Althea and therefore their derivatives have gone into receivership! Had an interesting problem recently when writing some Rail migrations scripts for an old non-Rails MySQL database. After writing the migration and running it via Rake we found that it was erroring with a complaint about the primary key. We checked that the table had an id column, it did but instead of id it was ID. ActiveRecord is very specific in what it looks for and so was not viewing this ID column as the primary key that it required when adding new rows to the table. Logrotate is an excellent utility for managing log files that can start grow into an unmanageble size, Tomcat's catalina.out is one such file. Truncate the original log file in place after creating a copy, instead of moving the old log file and optionally creating a new one, It can be used when some program can not be told to close its logfile and thus might continue writing (appending) to the previous log file forever. Note that there is a very small time slice between copying the file and truncating it, so some logging data might be lost. 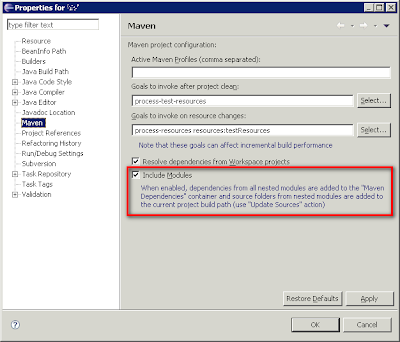 When this option is used, the create option will have no effect, as the old log file stays in place. This basically means that you don't have to configure your logrotate script to restart Tomcat just so you can tidy up your log files - it trades off uptime against completeness of log records. I found out about this from the Mission Data Blog in their post titled 'managing disk space with logrotate'. Is definitely worth taking a good look through the man page for logrotate to see if there are any other gems you can take advantage of for your setup. Back in July I blogged about Opening winmail.dat (TNEF) files in Thunderbird (on Ubuntu). Well a colleague at work has 'refined' my script so that rather than it create a folder on your desktop it simply opens Nautilus to display the contents of the attachment. The interesting part of this script for me is the $$ - this special script variable is the process ID (PID) of the currently running script, so it makes a temporary file called winmail_<current process id>.dat. Other than that it's pretty similar to my original script apart from opening Nautilus at the end. Now it's even easier to open and extract files from winmail.dat files! I found out the reason for the $$ from here. I recently upgraded my desktop to Gutsy Gibbon using aptitude rather than the graphical Update Manager and noticed that the performance of the machine had dropped significantly. The Enterprise Volume Management System (EVMS) is a project that attempts to provide a single, unified system for managing storage and filesystems. Rather than managing individual disks, partitions and filesystems; LVM Physical Volumes, Volume Groups and Logical Volumes; RAID arrays (both software and hardware) etc. yourself, using EVMS you can address them in one consistent way. The support for the EVMS package has been dropped by the Ubuntu team but if you didn't use the Update Manager to do the migration to Gutsy it won't have been removed. You are then only a reboot away from a faster running system! [warn] proxy: No protocol handler was valid for the URL /SomeUrl. Then you might want to check that you have more than just mod_proxy enabled. Mod_proxy is more of a virtual module relying on other modules to perform the proxying work depending on the type required. A common mistake is to have enabled mod_proxy but not enabled mod_proxy_http. Otherwise you will have to make manual symbolic links to them yourself. I was having some problems recently regarding settings inside a user's .bashrc file. When the user logged in their settings were not being picked up. I checked in /etc/passwd and saw that the user's shell was sh which was a symbolic link for bash. I assumed that because the shell was linked to bash it would have bash's behaviour - picking up .bash_profile, .bashrc, etc. If bash is invoked with the name sh, it tries to mimic the startup behavior of historical versions of sh as closely as possible. I.e. if it's called sh it works like sh!